Loviste is a small port, situated at the far end of the Peljesac peninsula, opposite the island of Hvar. It is 17 kilometers away from the town of Orebic, but connected with it by an asphalt road that connects also other resorts on the island, such as Ston, Viganj and Kuciste. 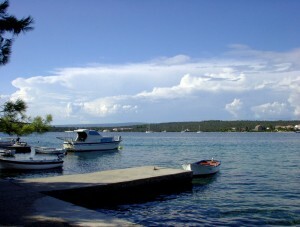 Loviste is also close to major tourist destinations in Dalmatia. Korcula is only 15 minutes away by boat from Orebic, and Dubrovnik, which is the center of South Dalmatia, is only two hours of driving away. Loviste was founded by fishermen from Hvar, mainly from towns Bogomolja, Selca and Gdinj. They found that this area is rich in fish and very suitable for fishing. Loviste was officially founded in 1884 by the people from the town of Nakovanj. This area has been inhabited since at least 8000 years BC, as testified by the excavations in this area. Fishing is still one of the main activities of local people who are also involved in the production of olives and olive oil. Most locals are also dealing with tourism, some of them even with fruit and vegetables growing. Loviste is suitable for tourism due to its long coastline of the bay, protected from the wind, warm seas and many sunny days. The sun shines up to 3000 hours per year. Because of the natural beauty and peace, tourists love to return in this small village in southern Dalmatia. Some visitors named this part of Dalmatia “an oasis of peace”, because here you can easily rest and regain energy. Many tourists are coming back because of excellent cusine and domestic vegetables and fruits as well as good Peljesac wines.